Identify the correct intervals to win. 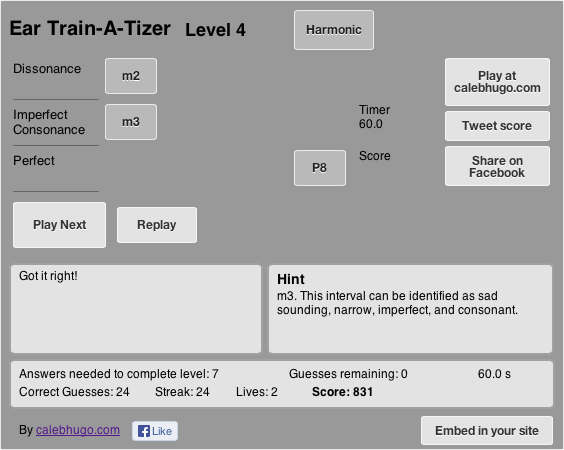 This ear training game will teach you to identify intervals. That is, to hear distance. 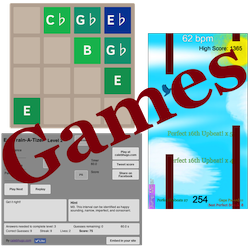 Select the interval types that you want to practice identifying, select the modes you want, and practice them! Or just play in game mode and get the highest score you can. Identify intervals with friends to see who can get a higher score. Harmonic: the notes play at the same time. Melodic ascending: the lower note is played first. Melodic descending: the higher note is played first. Perfect Interval – This type of interval includes the unison (a distance of 0, also known as two notes on top of each other), the fourth, the fifth, and the octave. They are abbreviated as PU, P4, P5, and P8. They can be easily distinguished from other intervals by their pure and simple sound. Click some in the game using “listen mode” and compare the perfect intervals to the imperfect. Imperfectly Consonant Interval – This type of interval includes the minor third (m3), major third (M3), minor sixth (m6), and major sixth (M6). They are easily distinguished from other interval types by their pleasant and yet complex sound. Click some of these in “listen mode” and compare them to the perfect and dissonant intervals. Dissonant Intervals – This type of interval includes the minor second (m2), major second (M2), tritone (TT), minor seventh (m7), and major seventh (M7). Most people do not consider dissonant intervals to sound pleasant without a larger musical context. They can be easily distinguished from consonant intervals by the way the notes grind against each other. PU – 0 – Two notes at the same frequency. m2 – 1 – An abrasive and grinding interval. The two notes are very close together. M2 – 2 – The notes are still very close together and they grind together. But it’s not nearly as harsh as the m2. m3 – 3 – Still pretty close together. The sound, however, is pleasant…but sad. M3 – 4 – Another pleasant sound. But now it is happy! P4 – 5 – A strong and pure sound. Hard to distinguish from the P5. The hints in the game will help you. TT – 6 – Just about as abrasive as the m2. But you can tell that the notes are father apart now. Don’t be fooled! P5 – 7 – A stronger and purer sound than the P4, but hard to distinguish. The hints in the game will help you. m6 – 8 – Sounds like the thirds, but some thought with reveal the the interval is bigger than a third. M6 – 9 – Same story as the m6. The hints will help you figure out which sixth is which. m7 – 10 – Sounds about as dissonant as the M2, but you can tell it’s farther apart. M7 – 11 – Sounds about as dissonant as the m2, but you can tell it’s farther apart. P8 – 12 – Sounds like a PU, but you can tell it’s farther apart. This one can be tricky because the top note is literally inside the sound of the bottom. They really can sound like only one note.